Another colloquialism that comes to mind is the yo flip. You know that version of the tre flip with the spread out front-foot catch and the back leg catching so late that it almost looks like a glitch in the video? That’s yo. Some skate legends have that natural yo flip—that effortless front foot catch that brings a tear to your eye because, dammit, sometimes life is just beautiful. Dylan Rieder, Janoski, Desarmo, and Gustavo all come to mind. The only drawback to having such a beautiful trademark style in skateboarding (whether it’s footwork or threads) is that it’s sure to amass a cavalcade of people who mimic it exactly, while more or less forsaking their own natural style. Just like how the early 2000s saw an influx of studded belts and bracelets accompanying slim black jeans and white button-up shirts, the yo flip has an endless list of imitators. But what the chorus of forced yo flips neglects is that the skaters mentioned above have a similar, natural style in every trick (not just the tre flip), making the yo flip a ripe cherry on top of an already delectably steezy cake. Conversely, if the yo flip is merely a single outlier in an otherwise radically different style, it sticks out like a sore thumb. Take Josh Kalis, for example: he undeniably has a classic, textbook tre flip. While it’s not a yo flip, his tre matches the style he exudes with the rest of his tricks. Can you imagine what a yo flip in the middle of an otherwise Kalis-esque lineup of tricks would look like? What about Joslin doing one down half-a-million stairs? Exactly. Be aware, this recipe requires a little more prep work than the other recipes I’ve introduced and involves a few more ingredients, as there are several working parts. If the other recipes are just like learning a flatground trick, think of this one as learning TJ Rogers’s dream trick. It may take a little more effort to get it down, but the roll away is 100% worth it. 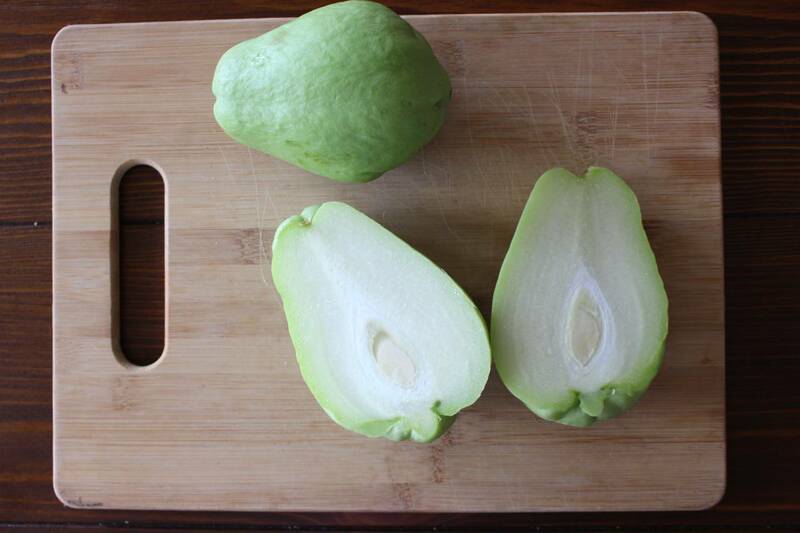 Chayote (pronounced chi-yo-tay) is a South American squash that, like other gourds, is relatively low-calorie while still serving as a good source of complex B vitamins. While it is generally firm, it takes on the pliable nature of a fish fillet when sliced and steamed; further when marinated in a squeeze of lemon, dressed with some fish seasoning and breaded, it takes on a similar flavor to a fillet of fish nestled in a tangy Baja-style taco. I’ll let you come to your own conclusions, but I’m pretty stoked on this one. 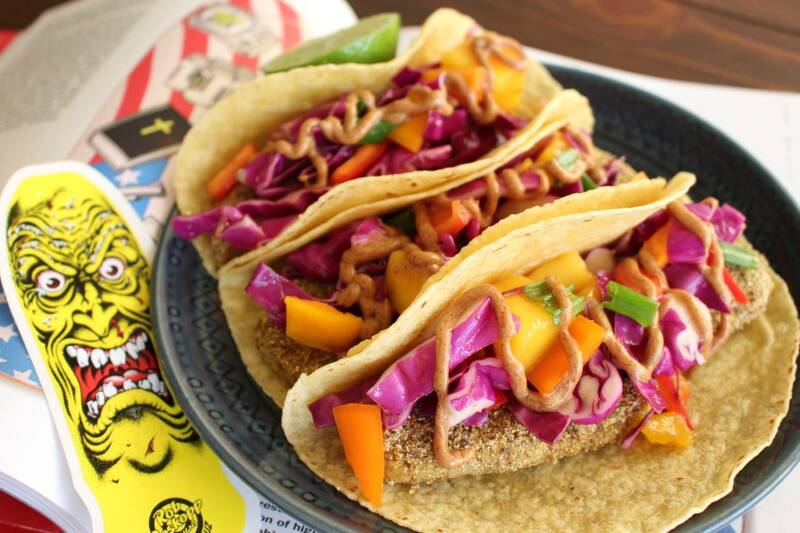 The squash, the almond butter, and the slaw all come together in equal parts to put together a very flavorful (and picturesque) taco that could fit seamlessly in a Wahoo’s lineup (note: don’t throw these at Willy Santos). 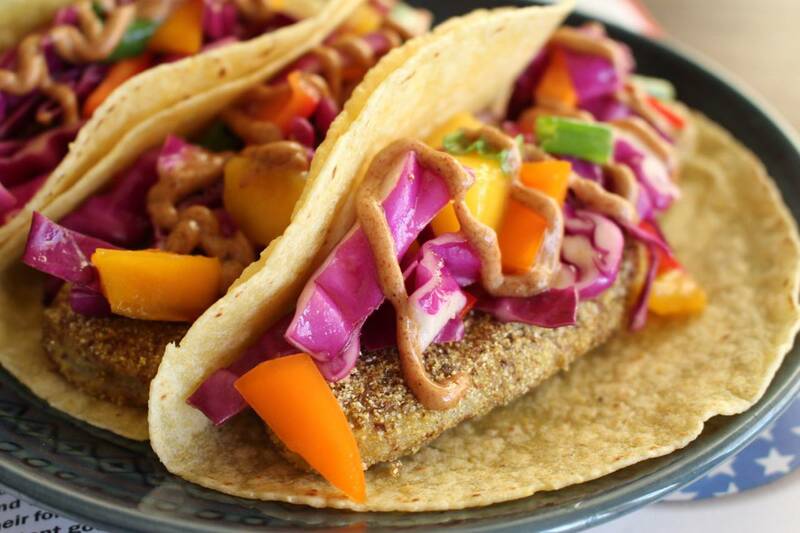 The crispness and tanginess of the slaw meshes perfectly with the spice and creaminess of the almond butter, while the lightly-breaded, melt-in-your-mouth fillets of squash provide the subtle crunch and warmth you’d expect from a fish taco. 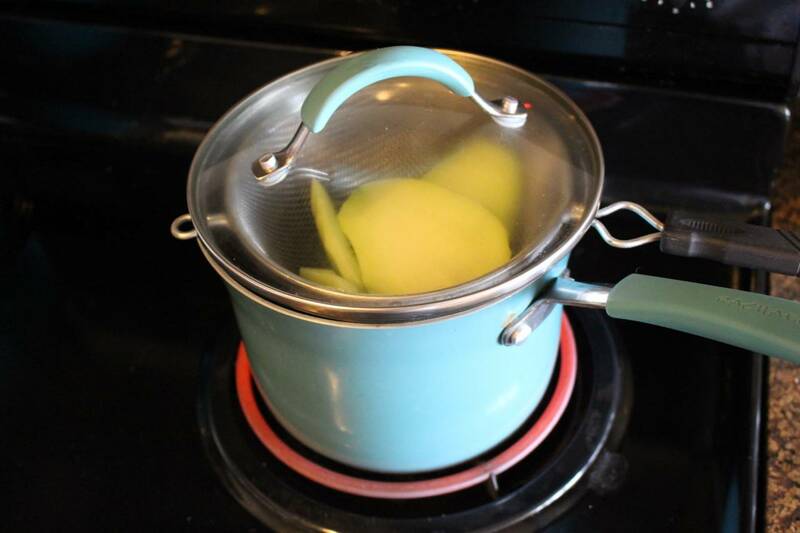 The longest part of prepping the ingredients will be steaming the chayote squash, so it makes sense to start with that and take care of the other steps while it’s steaming. First, grab your squash and cut it lengthwise, as shown below. To cut it into fillets, the most important thing to remember is that any shape you make must be thin enough to steam all the way through. 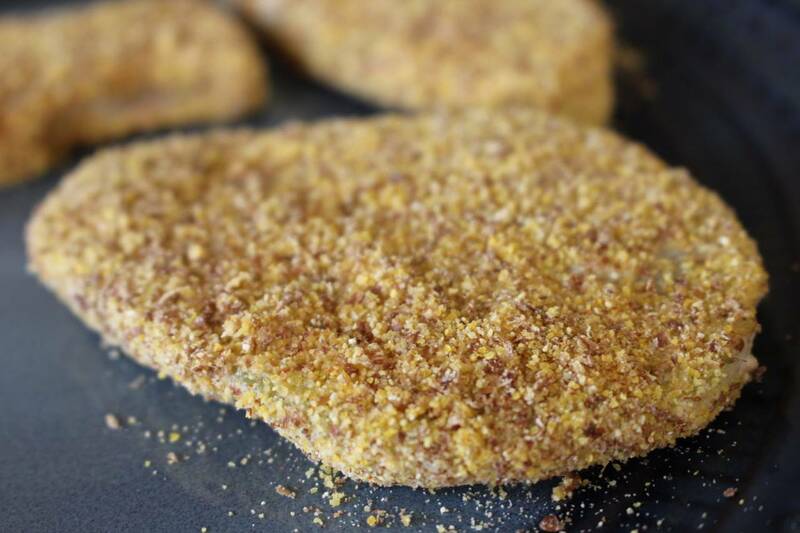 If you want to make larger, flatter fillets, then you can get two good fillets out of one squash by cutting it lengthwise and whittling away the edges. If you want thinner fillets, then you can further cut the squash into quarters and whittle it to thinner fillets. Or, like I did, when I was considering naming this recipe “fishtail” tacos (yeah, that almost happened), you can whittle them into fishtail boards. Either way, just make sure your fillets are no more than ¼ “- ½” thick. Dice up your cabbage, sweet peppers, green onions, and mangos, and throw into a large mixing bowl. 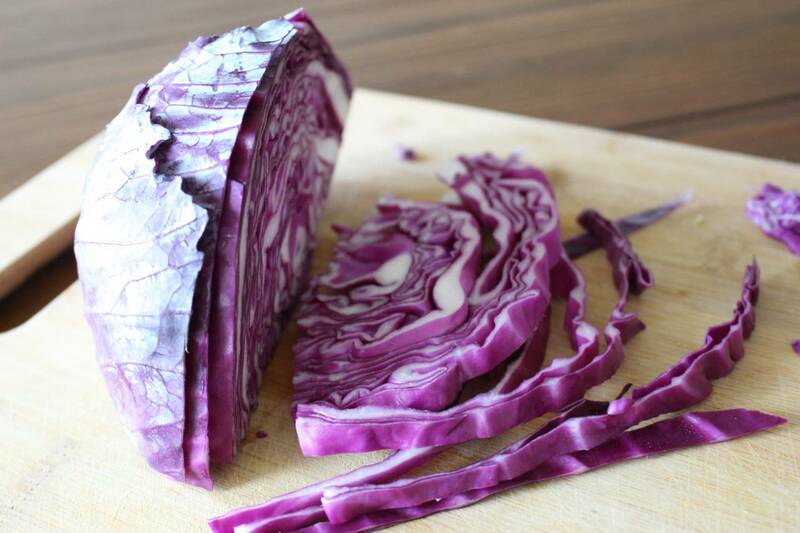 If you’ve never diced a full cabbage before, start by cutting it in half from top down to the stem and then, using the same longitude, cutting each half into quarters, as shown below. At a slight angle, cut the white stem out of each quarter, so that the quarter still stays largely intact. Placing the quarter down on one of its faces, slice the sides from top down to bottom until you’ve gone through the whole quarter. 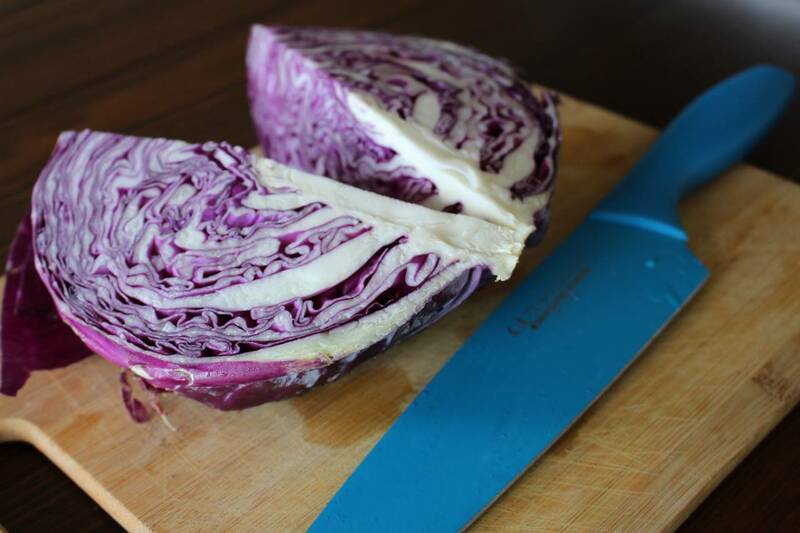 If you like shorter strings of cabbage, it also helps to rip up the strings into smaller pieces after slicing. Much like an avocado, the perfect mango should have a slight give when pressed lightly. If it’s too firm, it’s not ripe yet; if the skin breaks, it’s past ripe. 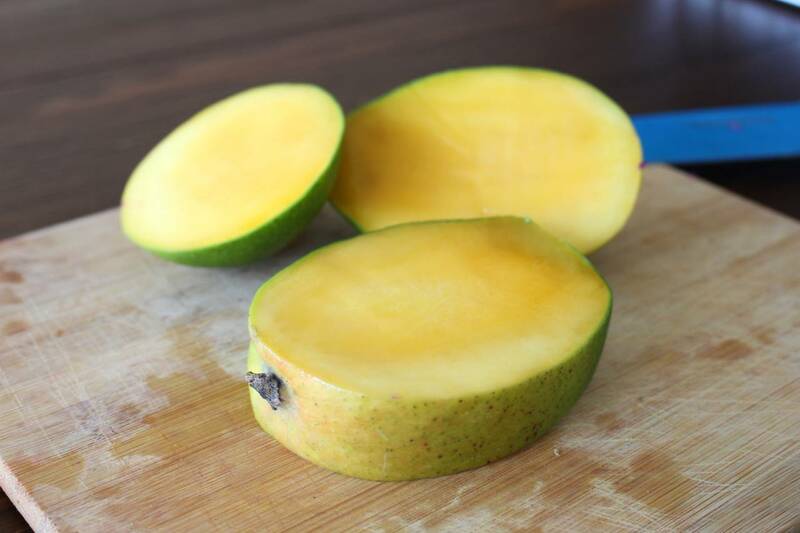 To cut up a mango, stand the mango up lengthwise and locate the stem. Thinking of the bird’s eye view of the mango as an axis, slice about a quarter of an inch from the stem on the shorter, equidistant sides of the mango, all the way down to the bottom, as shown below. If you’re finding it difficult to slice, you may be slicing through the front/back of the mango, rather than the sides. 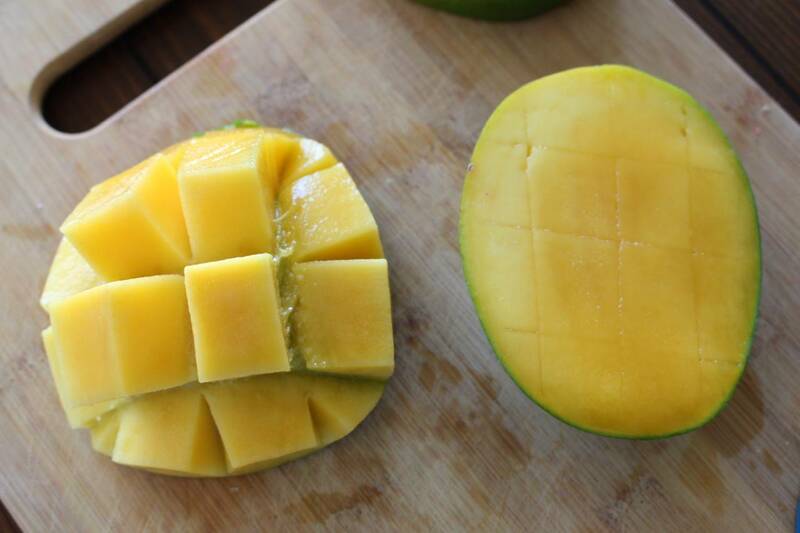 Once you have the sides, without slicing through the skin, cut a grid through the meat of the mango and then press up through the bottom of the skin to pop the cubes of mango up. Simply slice the cubes off into the bowl. 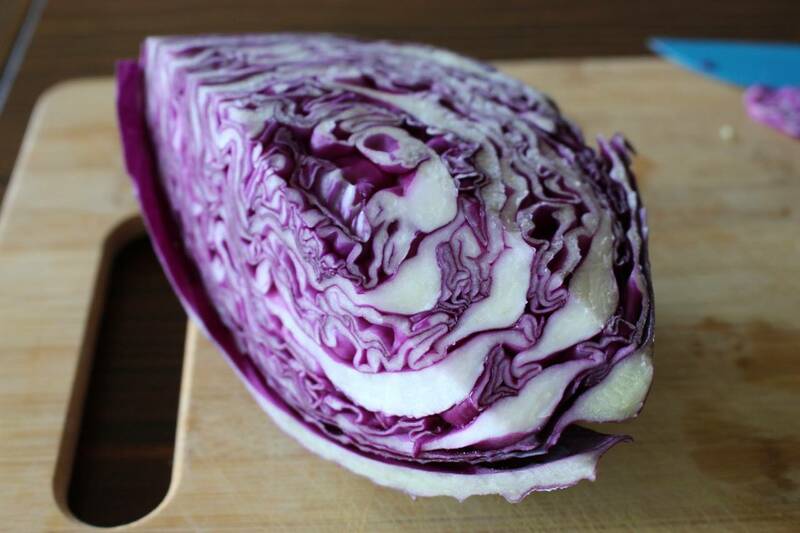 Once all the slaw fruits and veggies are diced up, add in the olive oil, lime, and agave, and lightly toss it until it’s evenly distributed. Set aside for later. 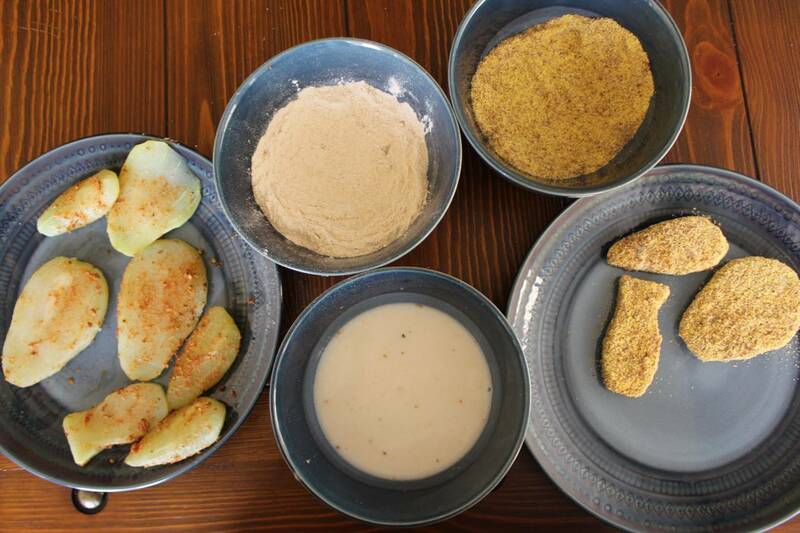 In a bowl, mix up the cornmeal, flax seed, salt, and some extra fish seasoning (no more than a tablespoon). This will be your breading.